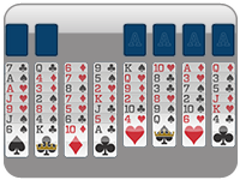 247 Freecell is your one stop hub for the best in Freecell gaming. 247 Freecell is just one in a line of popular card games from 247 Games - who are striving to bring you the best in card game play in all the web. 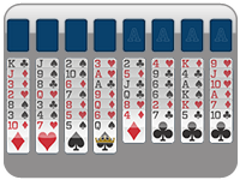 Sit back and enjoy this brand new Freecell site which offers SEVEN freecell variations, large cards, beautiful graphics, and precise gameplay. Freecell is a popular game playable by gamers of all ages. The notion is quite simple. Arrange the cards inside the game to ultimately move them all into the home cells by suit. 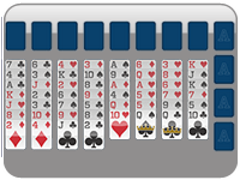 When moving cards around in the columns, cards must be moved in order from highest (king) to lowest (ace), alternating colors. Use the upper open cells to help you move the cards around within the game. Try to have a plan for all the cards you enter into these freecells though, because once they are there, they are hard to get out! You may only move a stack of cards with the correct number of cards or less - this number is determined by how many open free cells and open tableaux you have in the game. You can always move one card, so just add the number of those other open spots to see how many cards you can move in a stack at one time. Don't worry, though, Freecell will tell you if the column is too large! Move all your cards in the game into the home slots to win Freecell! Freecell is a great game because it is winable almost 100% of the time, which it the highest percentage for any random deal in a card game. 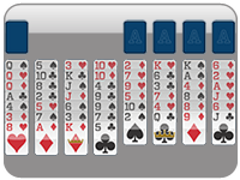 247 Freecell offers 6 other games though to help you enjoy this classic card game without you getting bored! 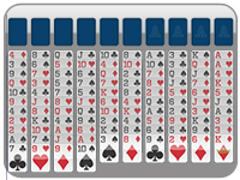 Be sure to try 1 Freecell, 2 Freecell, 3 Freecell, Double Freecell, Baker's Game Freecell, and Eight Off Freecell! These freecell variations are sure to please all freecell lovers! 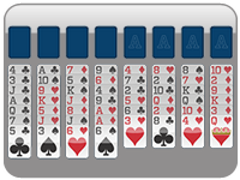 247 Freecell offers many freecell games for every type of freecell lover. 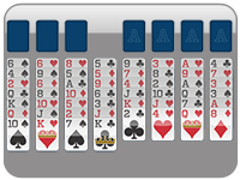 Classic Freecell is over 99% solvable, making your moves always count! Place all the cards from the deck into the home slots to win Freecell! Freecell is a game to be enjoyed by all ages.